commitment is $2,000 and over. May aboard the 65-foot yacht. cruise will set forth at 10:30 a.m.
out four years of Begin's premiership. |\ iesel in l held Thursday, Jan. Jew." lie was Iwrn in Signet. spokesman for the Jewish people. operation ?ifch the Morris J.
was Announced here today by Dr.
than 25 years of age by August. ( harges.cao be used ior politica. had been killed by Bedouins who. that he helped to bring about." daubed with slogans which read. reacted similarly to the incident. their help in cleaning the walls. but probably would cut back? In the story, Safadi predict*! succeed in having the ban lifted. Schuster are the vice presidents,! Blakley, site manager, 872-4451. Menu subject to change. Friday: Stuffed Cabbage Casserole, Mustard Greens, Peaches. wo more in the evening." iur and 15 minutes each), when Cindy Sper, Gloria Berkowitz! antastic, I was very moved. Thanks for a wonder day." littee which planned the day. "oiling hills off of Harrison Road..
Vs lifetime peace and serenity. fond, he is known as "D.R. will be served promptly at noon. checks may be sent to Mrs.
Carol Zielonka, and Helga Zipser. (Annual -S3.SOI Out of Town Upon Request. order to buy them, that I deL. For Reduced Israel Aid U.S. Turns Right-Will Israel Turn Left? errigan and Rev. .Jesse Jackson. in strategic corners of the world. joint defense ol joint in,wf*? I m excited by the challenge,"
liack land not loo far back. al ( .imp Coleman. Cleveland, (ia. .mil u national prize ol 11,000.
ation during the spring of 1981. Channel 8, P.O. Box 1410.
sponsors a variety of activities. man, assii.-il by Elaine Gotler. ticket holders following the show. of freedom and social justice,"
l K'lal Yisrael," Older stated. ing war between Iran and Iraq. beginning to bode ill for Israel. "Governors of the States and Special Distinguished Guests"
Reception being held at the Sheraton Hotel in D.C.
sonian Museum of American History. tend "The Inaugural Bali," in Washington. forward I shall strive to be deserving of your faith; and. youi yeoi is Idled with the satisfaction of great productivity. The Press." \i this next general meeting, James M. Talley. Mugdalent! Apartments, front recreation room. teering many hours of hardworking time were Ellen Wilson. Schaarai Zedek was held last Tuesday night at the Temple. and enjoyable evening for all. which il il is at all like past ORT art auctions will be super. or olfice and have a ball at the same time! this fascinating film, contact the USF Hillel office. very bad time to promote th! 117-11 and 19 abstentions, Mum. ated in any decent society." avaiable for purchase. If V"
for the task by Msgr. enough water to cover the seeds. with leaf and blossom tracts. about Israel and its Prime Minister. can even bring us to a new world war." that the Palestinians are suffering so much. Ml'AC" was a correct quote. trj big to achieve oil the F 15 sale. ment prepared to pressure Israel. ade any "deals" with the Nazis. in which the "deal" is discussed. city officials at City Hall. long as they leave us alone." Flanders, that "it's all over,"
the Jews who made a deal." tions Inc. m New York City. States and support for . that there was no treaty! haps with strains at times." as long as basic interests! and ties going, he added." ht to the living process. .or til what avail is it? it is made, "she said. nominated to ! * the chief U.S.
accepted i his job," she said. She addi d, in that connection. tan She noted that "confusion"
at its founding in 1945. 1978, Martin Frost from Texas. for i he elderly and handicapped. 250.000 happy Congress travellers must be RIGHT! think tney .t seen it all. Fund set for Thursday, Jan. 15.
survived by his wife of over 40 years. and bad resided In Norfolk for SB years. vived by bar daughter, Dr. Louise A.
Lubln and son in-law. Dr. Barry Lubln. ment has to fulfill its duties." Atlanta, Ga.; and friends Mr.
lard Bergman, from Beverly honor. :g afraid. God will fight for you." :: path, and the waters formed a wall on each side. For He has saved me." and all their food was gone, they grew frightened again. "Have you brought us here to die of hunger and of thirst?" they asked Moses and Aaron. water from the rocks; they will have plenty to eat and to drink." at 7 p.m. and Auction at 8 p.m.
Florida Federal Bank, Bearss Ave. Tampa Jewish Federation. 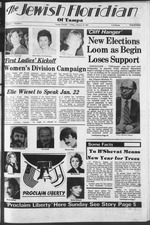 Women's Division First Ladies' Cruise for the 1981 Campaign. chapter) General Meeting 11:30 a.m. Jewish Towers Board! Meeting 4 p.m. Congregation Schaarai Zedek Religious! g National Council of Jewish Women Vice President's Meeting. :: Hadassah General Meeting 10:30 a.m.
>: tree, all others $3. 962-6338/9 Rabbi Leonard Rosenthol Robbi's Study, 12101N. vices: Friday, 8 p.m. Saturday, 9a.m. >'.'. i 000 per person. [ nifical ion laws expired. rmuny, Gruneburgweg 119. 6000 Frankfurt. I no later than hi-cemlxir 31. 1981.
not meet the Tecnnkra'S tough requirements. compared to 30 to 10 percent of other candidates. Wording to the NCSJ Chairman Burton S.
\[' Their many appeals were ignored. Jeksandr Landsman died on Dec. 28. ">d at theTecnnBn'lsrael InilfcuW of Teen-"
versity throughout the United States. human rights must stop at once." less a rather significant number." One space and Get one FREE! (One space per household before need) . major t. v. shows and was awarded a "( Jto"
repertoire ranges from mtxlem jarz to opera. Conservatory where he graduated with honors. distinguished author tor her number one bestseller. Tickets available by mail only. Seating will be assigned as order forms are received. payable to The Tampa Jewish Federatmn few----------tickets at $----------.